I like game jams a lot. They produce a bunch really neat little ideas in as little as 48 hours that entire companies wouldn’t touch with as long as an entire year to work with. And they’re also good for whipping up some random blog content when you haven’t been doing anything with your life for the past month or so. Starphonix is a fun little puzzle game that was made for Gamemaking Frenzy back in 2013 where the player has to retrieve data from a space probe sent out to make contact with alien civilizations. 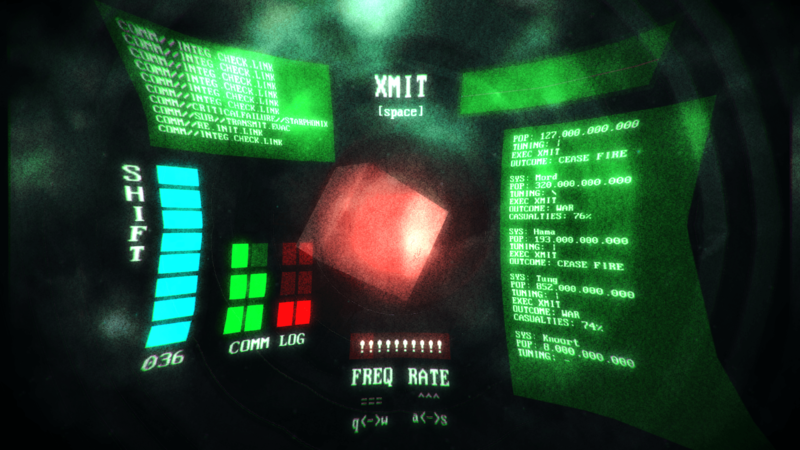 The game doesn’t have any instruction save for what’s written on the UI and the gameplay consists of adjusting the frequency and rate of the transmission and sending an “XMIT” command before time runs out. The time limit you have gets shorter the more transmissions you “synchronize” and every time you either run out of time or xmit a poor quality transmission you’re punished for it in a very… interesting way. If you get three failures in a row or six in total that’s game over and you have to start again. It’s a cute little game that deserved the prize it earned and I think it really showed a great concept in UI design, turning a pretty simplistic mechanic into a slightly eerie experiment in sci-fi storytelling.